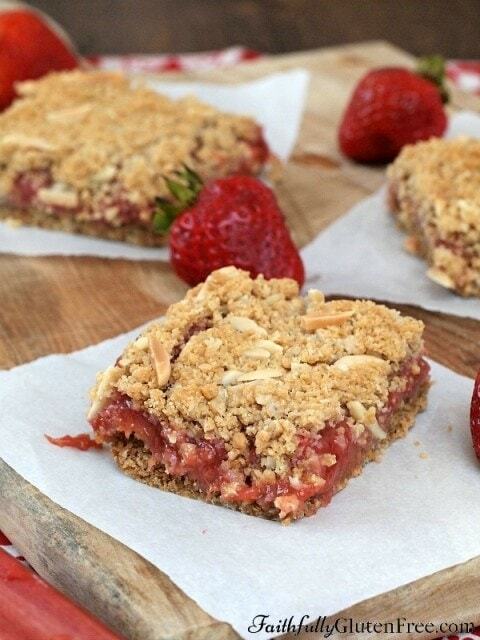 Celebrate your garden’s early summer bounty with these delicious Gluten Free Strawberry Rhubarb Squares. I love watching my rhubarb grow during the early spring. The green leaves poking out of the ground, waiting until I have enough stalks to make some gluten free Rhubarb Crisp for my family. Rhubarb crisp is what my family always demands from the first spring stalks, and if they had their way, that’s the only way we’d use the rhubarb all summer long. But as the local strawberries started to ripen, I knew I wanted to try a new recipe that combined the tart rhubarb with sweet strawberries. The crust for these squares is like an oatmeal cookie – flavoured with brown sugar and butter. I added slivered almonds to the top crust, but if you don’t have them, or need to eat nut-free, you can easily omit them. These squares got a thumbs up from my family. They loved this dessert so much, they may never ask for “just a crisp” ever again. Preheat your oven to 350 degrees F (177 degrees C). Line a 9x13-inch baking pan with parchment paper so that the paper runs up the long sides of the pan (this will make it easier to lift the squares out to cut them after they have cooled). Set aside. In a medium sized sauce pan, combine the rhubarb, strawberries, and lemon juice. Stir the fruit and cover with the lid before placing the pan over medium heat. Check and stir it frequently - as it heats up the berries and rhubarb will give off more liquid. If it stays dry, turn the heat down. The rhubarb and berries will begin to cook down, this can take 8-12 minutes, so be patient. You are essentially making a small batch of jam. In a small bowl, whisk together 1/2 cup granulated sugar and cornstarch. Once the mixture has come to a boil, add the sugar, and continue to stir until the mixture becomes thick. By adding the cornstarch to the sugar, you decrease the chance of the cornstarch clumping once it is added to the hot filling. Once the mixture has thickened, set it aside. In a large bowl, or the bowl of a stand mixer, stir together the gluten free quick cook oats, brown rice flour, tapioca starch, sugars, baking soda, salt, and xanthan gum. Add the vanilla and softened butter and run the mixer, with the paddle attachment, on medium speed until the butter is evenly distributed. The mixture should look like wet sand, and hold together when you squeeze some in your hand. Reserve about 1 1/2 cups of this mixture, and press the rest into the bottom of the prepared pan. Bake it for 10 minutes in the preheated oven. Remove the pan from the oven and spread the filling evenly over the crust. If using, stir the almond slivers into the crust crumbles that you reserved for the topping. Sprinkle this mixture evenly over the filling. Return the baking pan to the oven, and continue baking for 30 minutes, or until the topping is a nice even brown. Let cool completely before slicing and serving. The crust does get softer over time, so it is best the day it is made, but still delicious with a less crisp crust as well. These look so good Jeanine! I’m planning on heading home with a ton of rhubarb from my parents, so I’m looking for recipes to try. Thanks, Cindy! Sounds like you’ll have some fun in the kitchen when you get home! These are so pretty! You always do such a beautiful job styling your photos. I can just imagine how delicious these are. Perfect for taking on picnics or camping, too! Another amazing recipe- per usual! I just pulled the pan out of the oven and it looks and smells wonderful. But I have to confess I am a lazy cook – always looking for a shortcut!! In this recipe for the filling I did not pre-cook the rhubarb and strawberry mix . Also I omitted the lemon juice and in lieu of cornstarch used 4 tbsp minute tapioca. Also I did not pre-bake the crust. I baked the squares for 45 minutes and the filling is fully cooked and tender and the base crust done nicely. I’m sure the unsalted butter elevates this to a new level but since I didn’t have any I used plain old no name margarene (in the squares- not the soft marg) . And last but not least since I avoid xanthan gum I just substituted 1 tsp psyllium powder . Oh my I am tasting it now- so yummy!! Thanks again Jeanine!!! Ha, Kathryn, you pretty much took every short cut possible! 😉 Glad to hear that it still worked out though, even if the crust gets a little soggy, it’ll still tastes amazing. 😉 Thanks for sharing all the changes you made, and how they worked for you! 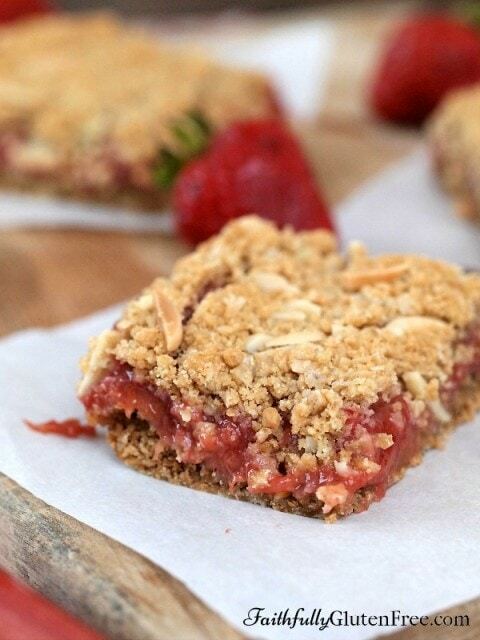 These are delicious…….I used blueberries and rhubarb….turned out great. Could frozen rhubarb and strawberries be used for this recipe?